The first of a new fleet of high-speed Freccia Rossa (Red Arrow) ETR 1000 trains has been presented at the InnoTrans international transport technology trade fair in the German capital. In Italy, the new Freccia Rossa will make its debut with an inaugural run May 1 to coincide with the opening of Milan Expo 2015. 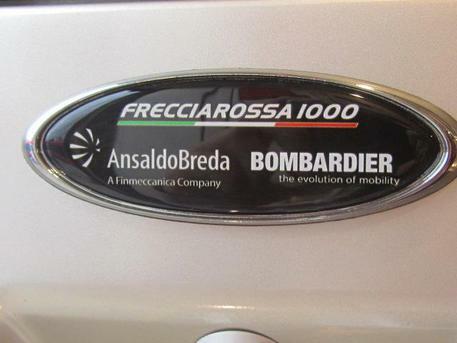 Made by Bombardier Transportation and AnsaldoBreda under a joint venture, the train is manufactured in Italy in the Pistoia and Vado Ligure manufacturing plants. The new ETR 1000 (italian version of the european V300 Zefiro) will have a commercial speed of 360 km/h, making it the fastest train in Europe with a max speed of 400 km/h. The new trains will gradually enter into service between 2015 and 2017, to a total of 50 trains acquired by Italy’s Trenitalia rail service for 1.5 billion euros. The train will enter into service in mid-June, connecting Rome and Milan in under 2.5 hours. The challenge to the air companies is opened!